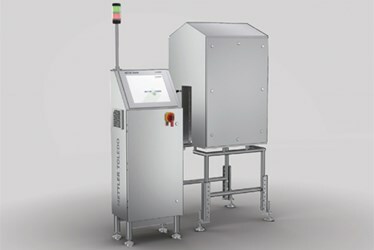 The METTLER TOLEDO Mosaic Compact is a turnkey inspection solution for round, un-oriented containers which utilizes a simpler, more accurate vision processing method than traditional 360° inspection solutions. The system is designed for easy operation by everyday users, reducing operator error. Unlike other 360° inspection methods which are cumbersome to set up, unable to adapt to different product sizes and require slower production speeds, the Mosaic Compact offers a more straightforward solution. A small footprint allows the Mosaic Compact to fit along crowded production lines, while flexible design allows for easy adjustments to variations in product position and packaging material. Drastically reduced footprint and IP65 construction allows for flexibility in system placement at any point in the production process. Mosaic’s unique paneling technology reduces the number of false rejects caused by faulty calibration and poor image quality. Globally deployable inspection solution means no matter where the production plant is, METTLER TOLEDO provides installation, training, service and support.